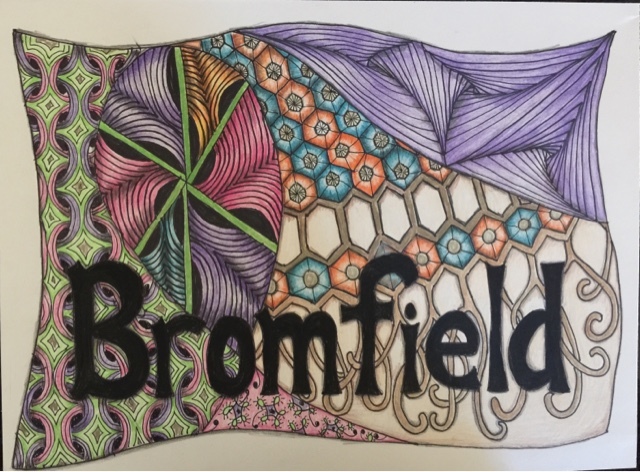 Today, I'm sharing three new pieces of art and one zentangle inspired art (ZIA) that I did awhile back. They are all different, different techniques, different media, but each was conceived with a certain technique in mind. Let me explain. Last week when I created the rainbow tulip, I had seen a YouTube video on using a watercolor technique called prisming. It involves drawing random lines through certain parts of the drawing (in my case the lilipad and the background). You begin coloring and when you reach a line, you change either the color's value or change the color. It's an interesting technique and though I didn't achieve the look I wanted in this piece, I still like the way it turned out. 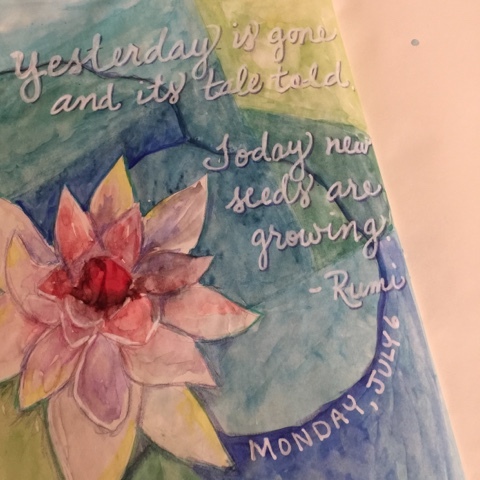 I probably should have used a watercolor paper instead of the Tomoe River paper in my daily journal. This is a technique where you randomly paint colors and then draw a figure on top. You then paint the background in different colors so the drawn part only has the original colors. As you can see, I began this piece by coloring the page in yellows, oranges and reds. 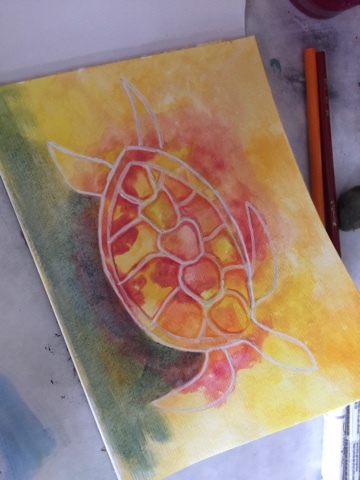 I drew the turtle in white and used colored pencils to accentuate pieces of the turtle. I then colored the background in blues, purples and greens which are the complimentary colors of the original colors. I've done this technique with acrylics before but I used Inktense blocks this time. It is ink-based so once dry, you cannot re-activate the colors even when wet. I was afraid my background would be muddy since complimentary colors produce different shades of grays. But I think it came out fine. The next two pieces are my entries for the Diva's Challenge. Please check out other entries here. 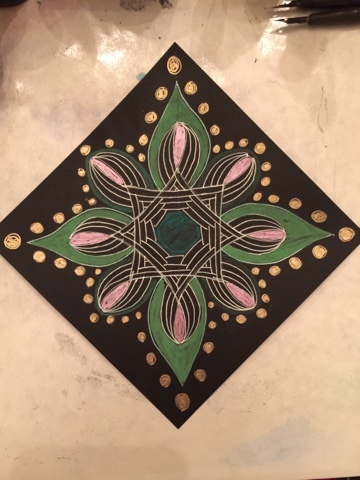 Lately, I've been enjoying using a black tile for my tangled pieces. As I mentioned before, It's a challenge to tangle without using a pencil first. I used the pattern called Loops to create this piece and used my Recollections brand opaque markers to color. I didn't even attempt to shade here. I think I'm going to use this pattern again for a zendala. I'm usually good about picking colors, but Immshaking my head on this one. I can't recall how I chose the colors. Purples, pinks and greens are colors I use often but adding orange, ultramarine, and tan to that just doesn't make sense. I do like the contrast of the black lettering against the colors. Perhaps some day, I will redo this one in different colors. Do you have a favorite color combination? I tend to use lots of secondary and tertiary colors, but hardly ever the primary. Currently, I'm loving teal and purple. Have a great Tuesday! Thank you! I collect color tiles on Pinterest to help me select color combos. Zia Zendala, captain of the starship Zentangle! Okay, I'll stop. At least I now know what zia means. I love all of your color combos. Art is art. It doesn't have to make sense. I like bright, jewel like colors. I've always loved yellow with magenta. It makes me happy. Well you asked. I've been told that magenta is my color. I had a bridesmaid dress in magenta that I actually liked! Your colors are beautiful, as are the sentiments on your work. Love that black tile with color. I have such a hard time with that! I like the randomness of the colors in the last one. It makes me think of a family flag. Good luck with your students! I love under painting! i think the colors work together well, not a single misstep. I love the other art work too, especially the prisming. I love the colors on the first one. They really compliment each other. Thanks so much for sharing the descriptions of the 3 coloring techniques. I really like that first one, prisming. Your Diva challenge tile is impressive considering that you didn't use a pencil first. I think I like color families (if that's the right term)--i.e. blues, purples and pinks---orange, red and yellow --- shades of green, also with blues. I have to try prisming on watercolor paper. I love the look when it's done right! Very different but wonderful work! I like them all! Beautiful Diva tile! Love your choice to use a black tile. I'm going to keep practicing on black tile! Thank you! Beautiful work! I'm finding Teal, Purple, Magenta & Apple Green to be my colors of choice lately. I really enjoyed reading the process you used for each piece that you did. They are all just wonderful to look at. I love that color on the black tile. I don't think I have many colors that would show up on black and will have to pull out some markers and see what might work. 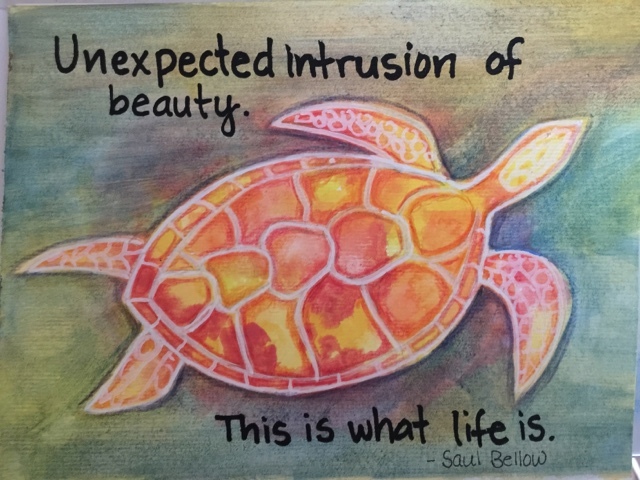 Your art pieces are beautiful...the turtle is my favorite, reminds me of trips to Hawaii and the respect there for sea creatures and the turtle (HONU) as a good luck symbol. Your diva tiles are stunning...I really like your color choices. I am an aqua maniac and tend to use it and greens quite often....I think it looks good with warm colors too. Two of the people joining the challenge this week used a color called Cobalt Green by Faber Castell that I think that I have fallen in love with....might need that color.